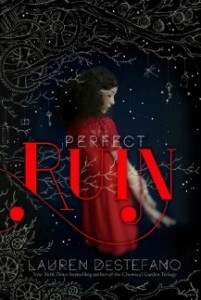 With Perfect Ruin, Lauren DeStefano has written an amazing, imaginative world filled with incredible, lovable characters. She’s descriptive and elaborate, and the reader will feel as though they are on Internment, living out the events of the story right alongside the characters. Morgan, the MC, is a daydreamer. She has a unique voice and through her eyes, we see what it’s like to live in a world in the sky. Morgan is the perfect balance of curious and obedient. She’s curious about the ground, yet smart enough to know she shouldn’t think about it. Because of her brother, Lex, she knows all too well what thinking of the ground will do to a person. I found her character fascinating, and I loved seeing the story through her eyes. Pen, Morgan’s best friend, is an incredible character. She has all these beliefs and all this faith. She’s the obedient one, with her feet planted firmly on Internment. And yet she seemed like a wild card to me, throughout the majority of the book. I had this feeling she would end up getting into a lot of trouble. My suspicious were pretty accurate! Lex is a particularly interesting character. I don’t really know how to describe him without spoilers, but he’s a very insightful character, offering clarity at times when clarity is needed. And yet, he’s troubled and he knows more than he is letting on. We learn more about that as the story progresses. And then there’s Basil. I absolutely adored Basil. He was sweet and romantic, open-minded and loyal. He’s the perfect Book Boyfriend and I loved the chemistry and attraction between him and Morgan. He has some incredibly sweet moments throughout the book and I adored him for it. There are so many fascinating characters in this story, I could go on forever just discussing what I loved about them. But then I would also spoil the entire book for everyone. So just know that the characters in this book were fascinating and interesting. There were certainly some characters that were unlikeable. Every book has some unlikeable characters; without them, there is no conflict or resolution. And, in true DeStefano fashion, the characters never have an easy time of it. If you’ve read The Chemical Garden trilogy – all three books, I mean – you’ll probably read that, groan, and grab some tissues before sitting down with Perfect Ruin! And then there was that ending… Uhm, whoa! First of all, I totally guessed one thing and sort of guessed another, yet they were still shocking to read and I was thrilled! But that cliffhanger!!! The suspense!!! I seriously can’t wait a whole year to see what happens next! All in all, Perfect Ruin was an incredible read. I loved every second of it, I would definitely recommend it and I can’t wait to see what happens next! DeStefano is a truly incredible story-teller and I can’t wait to read more books by her! I agree with just about everything here! Lauren DeStefano’s writing, worldbuilding, and characters were amazing in the book. Right?!?! I can’t wait a year for book 2!!! Actually, I did read WITHER a couple of years ago. I loved DeStefano’s writing, but I’m such a one guy/one gal person, I was pretty creeped out with the whole “multiple wives” thing. I never did finish the trilogy. I can definitely agree, though, that she’s an excellent writer! I completely understand. That part was a bit odd to read, but the series was amazing, overall! I hope you decide to finish the trilogy at some point! Oh please, finish the series. You will be so happy you did. Hmmmm…I do remember being curious as to what happened to the couple once they escaped, but not enough to push myself further. I have so many books I want to read…do you really consider it worth my time? Was it that good? How would you compare it to the quality of trilogies like the “Hunger Games” and “Legend” series? To be honest, I don’t feel the Chemical Garden covers scream “Romance novel” so I’m not sure I agree with that. But the fact that it’s dystopian might have turned some people off, especially with all the other dystopian novels that came out around the same time. I do like some romance in the books I read, but I’m glad Lauren focuses more on the plot than the romance and I do agree that Lauren is a fabulous writer!